There is so much information on resumes, that if you read 30 different sources, you'll probably discover 30 different opinions. It's frustrating and aggravating to most job searchers. Still, if you want to compete in the job market, one thing is for certain: you need a dynamite resume. Hiring sources today will not even speak with you without having a resume for them to review. Even if you are the BEST candidate for the position, hiring authorities will not bring you in for the interview if your resume does not grab their attention. 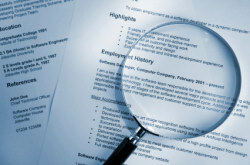 Should You Write Your Own Resume? In short, the answer is "no." Why? At GetInterviews.com, we guarantee interviews in 30 days or we'll re-write for free. Think about that for a moment: if we weren't completely confident that you will get interviews in 30 days using our resumes and cover letters, we would never offer that guarantee! Who wants to be re-writing resumes? No one: and we don't have to because our resumes WORK. If you're competing in the job search of TODAY, you'd better get wired or you're going to get whacked. You can no longer get by the way you once did -- just using paper resumes to answer ads, contact executive search firms, etc. Electronic forms of your resume (e-resumes) must meet standards that are required by various databases and Internet sites, or else it will be rejected. It's more than just eliminating bold and underlining on the resume, and it isn't about loading the resume with html. The greatest opportunity in job search right now is on the Internet, through both companies' and recruiters' sites and databases. If you're merely a wannabe and not competing with a sophisticated e-resume -- you're dead. The electronic form of your resume must meet some standards that have been necessitated by the various databases and email systems. It must be a plain text document and all formatting such as bolding, tabs, underling, italicizing, etc. that you cherish in your traditional resume must be removed. Also many hidden commands that are entered into the document created using word processing programs must be removed so that they do not corrupt or distort the resume when it is received by a hiring agent's database or email. You can try to beat the system by entering a resume loaded with html, or other formatting commands, and sometimes you will get away with it, temporarily. Sooner or later, your resume will be corrupted - guaranteed! Don't fight the system! Do it right the first time!